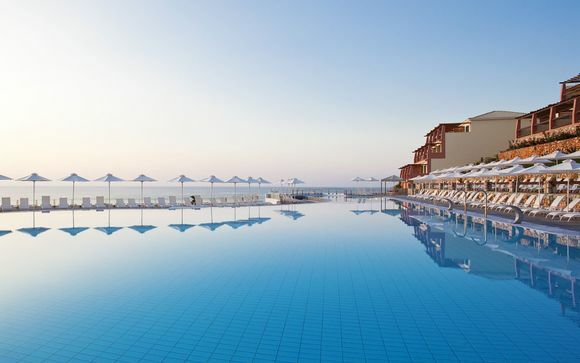 Stays in Kefalonia up to -70% off To take advantage of these offers, join now for free! This beautiful Greek island is a firm favourite for blissfully sunny breaks and stunning scenery. With its white stone sand, dramatic rolling hills and popular beaches, you should choose this destination if you are looking for a relaxing beach break with a hint of adventure. 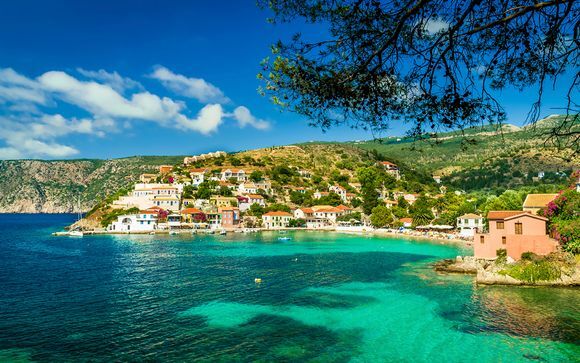 Kefalonia – also referred to as Cephalonia – is approximately 30 miles from mainland Greece and is one of the country’s most visited tourist destinations. The island is ideal for romantic breaks and draws people from all walks of life who come to experience its beautiful backdrops, trek in its woody forests and mingle with its friendly locals. One of the main areas of outstanding natural beauty is the Mount Ainos National Park. This protected area makes up a large proportion of the island and draws visitors wanting to escape the hustle and bustle of its lively coastal towns. The park hosts various outdoor pursuits, such as hiking, cycling and orienteering, as well as several extreme sports. Nearby are also several attractions, including natural mud baths that are situated against hilly backdrops. Kefalonia boasts some of the most inviting beaches in Greece. For those that love a typically beautiful white sandy beach and azure blue seas, you won’t be disappointed here; as a starting point, head to the popular Skala beach for sand to rival that of the Caribbean, and crystal waters to rival those of the Maldives. And for those that like a little adventure in their day out at the beach, Myrtos beach is full of pretty stones and rock pools to explore. Those that enjoy a little watersport with their sunbathing will not be disappointed in Kefalonia. Most of the touristic beaches offer a wide array of sports – from water skiing to parasailing to banana boating. And if you fancy splurging out on the ultimate day on the seas, many beaches and marinas offer luxury boat and yacht hire, as well as a range of excursions to help you experience the best of the stunning surrounding coastline. Greece is home to some of the continent’s best wine, and therefore vineyards are a-plenty throughout the country. Kefalonia’s warm climate means it is home to some fabulous, world-class vineyards that produce some of the region’s most sellable wine. The island’s tipple is infused with wonderfully aromatic citrus notes and a rich taste that you will be hard-pressed to find in any other wine-making region in Southern Europe. There’s no doubt that Greek cuisine is among the most distinctive and desirable in the world. And, if you are a foodie, you’ll be in for a treat during your stay in Kefalonia. Dining is a communal experience on this island, and a family dinner is the most important point of most days. Dishes are commonly made to be shared, with classics like pitta and tzatziki frequently served. Expect to also be served plenty of olives, fish, oils, grains and poultry, and look out for favourites such as horiatiki (traditional Greek salad), keftedes (meatballs) and dolmades (stuffed grape leaves). It is easy to while away an entire evening in one of Kefalonia's many traditional or family-run restaurants – locals will go on eating well into the late evening in true Mediterranean style. You are sure to find some world-class restaurants and local gems among many of the island’s main coastal towns and villages – the food enthusiast’s dream! If you are looking for an adventure or a truly relaxing break to recharge your batteries, look no further than our handpicked selection of Kefalonia holidays. Have a browse through our discounted deals to find unrivalled luxury hotels and experiences at affordable prices. If you’re a fan of large resorts, how about the beautiful Apostolata Island Resort and Spa? 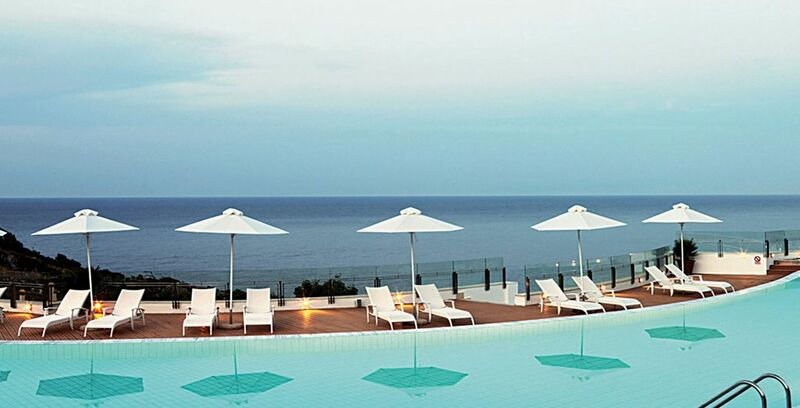 The four-star property boasts an extensive infinity pool and rooms with balconies looking directly out to sea. Or if you prefer smaller boutique resorts, we have personally selected the Kefalonia Houses, a small hotel with a homely vibe, a pretty pool area and landscaped gardens. Another of our favourites is the Kymata Bohemian Resort, a collection of seaside bungalows with uninterrupted views and private pools. Another stunning property available to book on our site is the Alexanna Apartments. Situated on a rolling hillside, many rooms offer striking views out over lush greenery and azure blue seas – offering the perfect environment in which to relax. Kefalonia is famous for its stunning landscape and the best way to experience it first-hand is by hiring a car or an open-top jeep. Among the highlights to visit by car is Fiscardo. 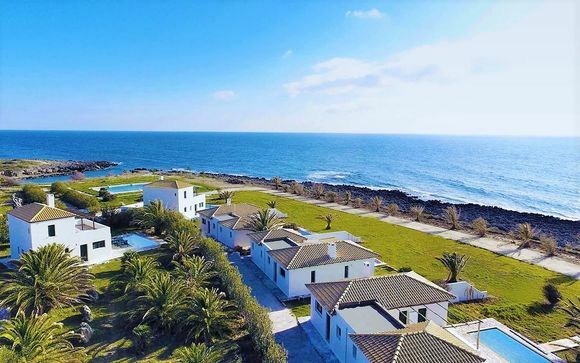 The main thing that makes this village unique is that it’s set around a gorgeous private marina, which is home to a variety of boats, such as yachts and traditional fishing boats. The village houses some of the best local fish and seafood restaurants on the island – and is therefore popular for those that are passionate about locally-sourced, fresh food. Another popular village to visit if you have a car is Sami. Thought to be the most scenic village on the island, this coastal town is surrounded by amazing landscape, including coves, beaches and dramatic hills. This is the island’s second largest port, and is also therefore fairly upbeat, with lots of things to do. There are also plenty of little bars and cafés offering a perfect alfresco dining experience, and enviable views out across the sea. 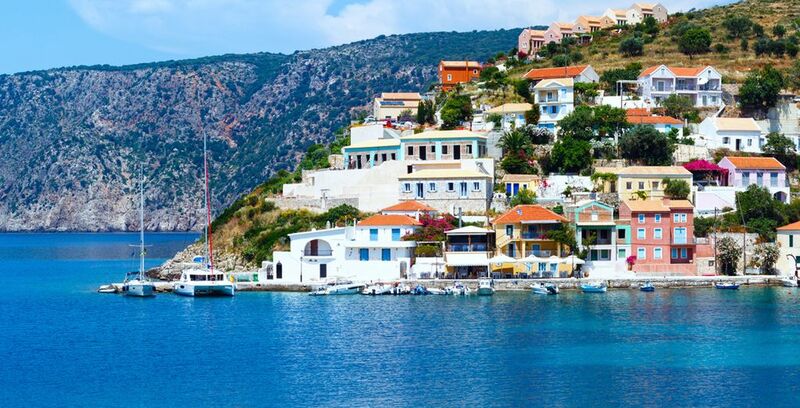 Kefalonia enjoys a sunny climate all year round and is particularly warm in the summer, while mild in the winter. Temperatures can reach the mid-thirties in July and August, and typically don’t fall below 10-15 degrees during winter. Kefalonia offers relatively good value as a holiday destination compared with many other southern European destinations. Tourist towns are typically more expensive, but local villages offer a more value-for-money alternative. Meals are fairly cheap out of the towns, and taxis and public transport are moderately priced in comparison to other parts of the Mediterranean. Kefalonia (sometimes spelt Cephalonia) is located in the Ionian Sea, roughly 30 miles west of mainland Greece. The island is a popular tourist destination, drawing visitors from around the world with its heavenly beaches, pleasant climate, lush forests, friendly residents and delicious food. 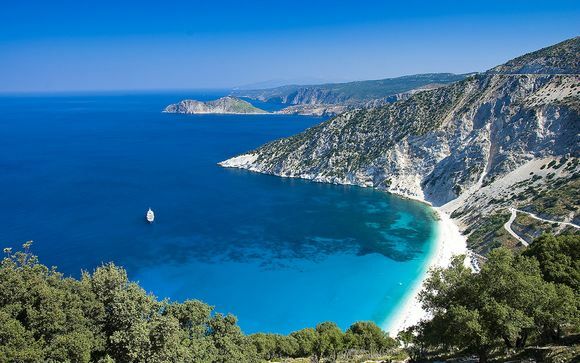 An area rich in natural beauty, there are many things to see and do in Kefalonia. As well as exotic beaches, visitors can explore the quaint and traditional villages of Argostoli, Fiscardo and Assos, and head to Mount Ainos National Park. This park is filled with fir and pine trees, interesting caves and magnificent panoramic views. For walkers, there are a variety of trails to choose from, so you're sure to find one that suits your ability. The island is home to some of Greece's most beautiful beaches. You can expect clear azure waters and pristine white sand or stones at them all. 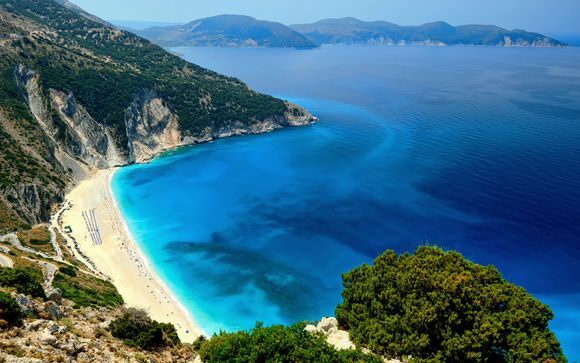 Myrtos beach is one of the most stunning, with gorgeous natural scenery as it lies between two mountains. Antisamos and Skala beaches are also recommended, with Skala having the added benefit of being sandy. Most beaches on the island offer watersports and have nearby cafes and restaurants. 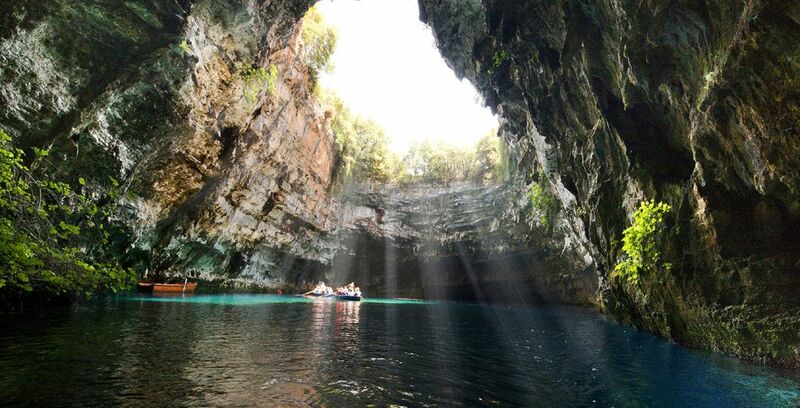 For a slightly different experience on the water, the Cave of Melissani contains a lake with trees and plants surrounding it. At noon, the sun shines into the cave and fills it with blue light, resulting in a truly mesmerising sight. Kefalonia has some local specialities that need to be sampled on your visit. Olive oil production is a large contributor to the island's economy, so you can find some of the freshest tasting olive oil there. Kefalonian wild thyme honey is another product of Kefalonia; it is deliciously sweet and can be purchased at many souvenir stores. The local wine, robola, is widely acknowledged as one of Greece's best wines and has a rich taste with citrus notes. Kefalonian meat pie is unique to the island and is a tasty rustic comfort food. You'll also find standard Greek fare, such as gyros and moussaka, throughout the island. For handpicked deals on Kefalonia getaways, sign up today. You'll be able to enjoy your stay in Greece to the full with our exceptional discounts. Discover our family holidays plans and holidays to Kefalonia.